How to start an import business in Kuwait? How to get import licence in Kuwait? 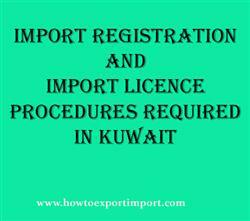 What are the procedures for registration as an importer in Kuwait? What are the certification formalities to import to Kuwait? This post explains about import registration procedures to be obtained from Kuwait government authority for importation to Kuwait. The import of merchandise into Kuwait on a commercial basis can do only by Kuwait individuals and firms who are registered with the Kuwait Chamber of Commerce & Industry (KCCI). The importer should also possess an import license issued by the Ministry of Commerce & Industry (MCI). This information is about import licensing procedures to import goods to Kuwait. If you have to add more information about import permit and registration required to import goods to Kuwait, share below your thoughts. Registration needed to import to KUWAIT. How can I register to import in KUWAIT. What Licence requited to import in KUWAIT. Import registration procedures required in KUWAIT. Import Licence process in KUWAIT. Process to import to KUWAIT. Requirements of registration to import to KUWAIT. Registration requirements in KUWAIT to import. How to export from India to Latvia? How to Import to Jordan? How to export from India to Kuwait? How to export from India to Mexico?